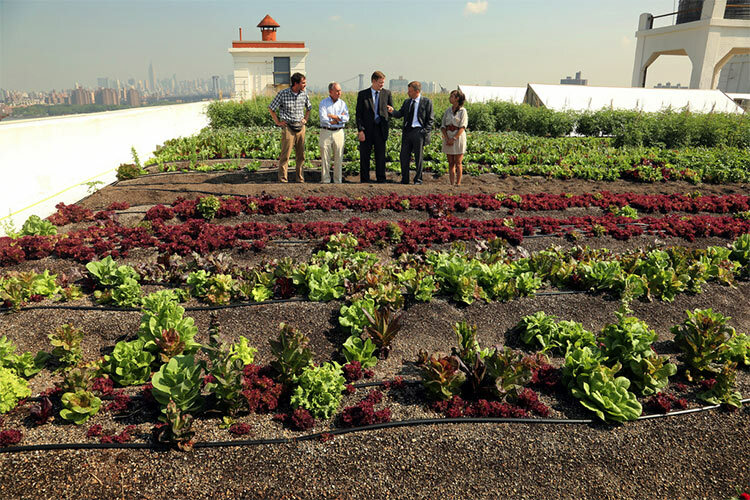 Mayor Bloomberg surveys the Brooklyn Grange rooftop farm in the Brooklyn Navy Yard. Mayor Bloomberg’s administration has taken a famously fine-grained approach to transforming the city, from infrastructure and streetscapes to the super-sized soda and smoking bans. Despite the naysayers and complainers—and his administration’s occasionally tin-eared tone—these changes have been overwhelmingly positive for the city. Many of the city’s sustainability and public health goals dovetail. Promoting welcoming public space, an active populace, multimodal transportation, and access to healthy foods mean a more resilient, vibrant, and attractive city for residents, visitors, and businesses. New York’s greenmarkets have long played a role in boosting the city’s green and health agendas. While the markets continue to grow and expand into new neighborhoods and organizers work to attract buyers beyond affluent foodies, most of these markets remain somewhat rag-tag, once a week affairs. New York is a vast and largely rural state, and much of upstate is struggling economically. Agriculture, however, is an expanding sector, however modestly. Small farms are returning to the Hudson Valley, the Catskills, and regions to the north. According to the Times, the most recent agricultural census shows a small increase in the overall number of farms, the first such increase in 80 years. Agriculture itself is no economic savior, but as a part of a larger system of upstate tourism and downstate dining dollars, it is one that should be taken seriously and invested in with public and private funds. The next mayor and Governor Cuomo should work to craft a statewide plan linking upstate farms with downstate markets (as well as urban markets upstate). Adopting the best aspects of Bloombergian benchmarking, the plan should be followed by implementation and results should be tabulated according to a legible timeline. Comprehensive land-use and infrastructure planning, as well as architecture and urban design, have a central role to play. Regional processing plants for meat, dairy, and produce—perhaps developed through co-op models or in public/private partnerships—would allow growers to create value added goods available all year. Statewide land-use planning should support open space conservation, and transportation planning should help growers bring their goods to market efficiently. Here in the city, we need a brick and mortar (or glass and steel) year-round regional food market/hall. Several groups have been promoting such ideas during Bloomberg’s terms, such as the New Amsterdam Market, as well as a development plan for a year-round market in the Battery Maritime Building. The New Amsterdam Market is working to reuse the empty Fulton Fish Market building in the South Street Seaport for just such a use. That is a worthy effort that deserves support. But in a city of nine million, that doesn’t seem to be nearly enough. Each borough could certainly sustain its own market (as well as upper Manhattan). These should be well-designed, gracious public spaces worthy of New York’s world-class food culture, and reflective of our leadership in public health innovation and sustainable urbanism. Last month, one of the major measuring devices of the master plan PlaNYC yielded its first set of data. The Local Law 84 benchmarking ordinance was pegged to a suite of laws operating under the catchier banner of the Greener, Greater Buildings Plan (GGBP). 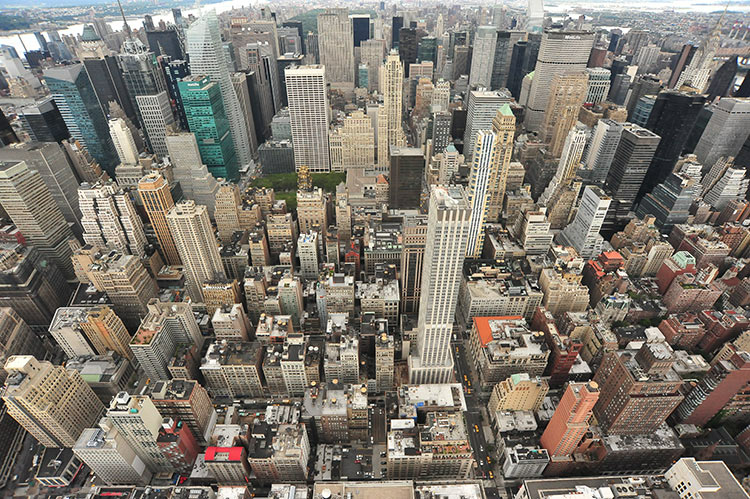 The ordinance required all New York City buildings over 50,000 square feet to report energy consumption. With more than 75 percent compliance, the first report was able to cull information from more than 1.7 billion square feet, making it the largest data collection of its kind for a single jurisdiction. 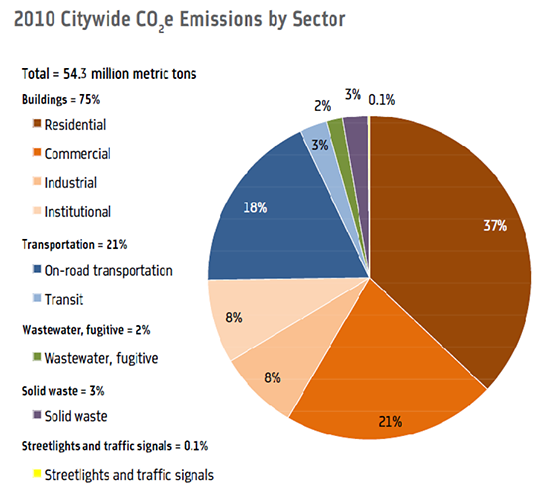 2010 New York Citywide Co2e Emissions by Sector. Despite the very positive participation numbers, there are a few kinks that have yet to be ironed out. The Environmental Protection Agency’s Portfolio Manager, the benchmarking tool used to collect the data, should be able to flag obvious mistakes, like a building square footage entry of zero, but it can’t. Also, building owners often entered square footage based on information they gave to the Department of Finance, meaning they entered square footage for space that had taxable revenue and left out the square footage for space that wasn’t rented. 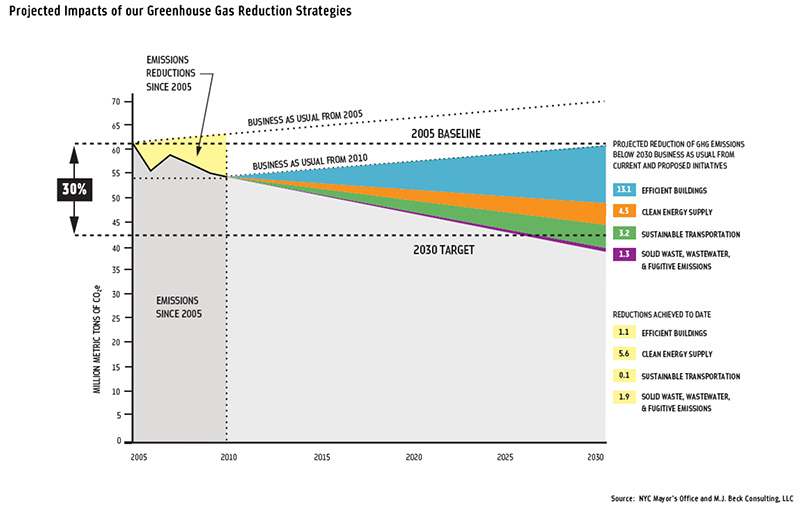 Projected impacts of New York's greenhouse gas reduction strategies. The U.S. Department of Energy is also working with the city to incorporate the information into a national database. Austin, Seattle, Philadelphia, San Francisco, and Washington, D.C. have all recently adopted benchmarking laws. The data will allow decision makers to compare policy and results. Buildings that are less than 50,000 square feet may also find their way into the mix. Though Kerr acknowledged that smaller building owners might not have the resources to track data, the city is looking at a less demanding program, perhaps a point-of-sale ordinance rather than an annual requirement. Well, you can't say we didn't warn you. As AN reported back in May there would be a three month grace period before penalties would be slapped on non-compliers of the new energy and water use benchmarking laws for properties over 50,000 square feet. That means time's almost up, folks--building owners must file reports by August 1. This may not effect the architecture profession directly (as much as the property owners), but by now architects should certainly be familar with the law and the Environmental Protection Agency’s Portfolio Manager Tool. Also, another clock is ticking for energy calculations on all architectural drawings. In September the State will start conducting hard audits to make sure the numbers are there to back up the reporting. 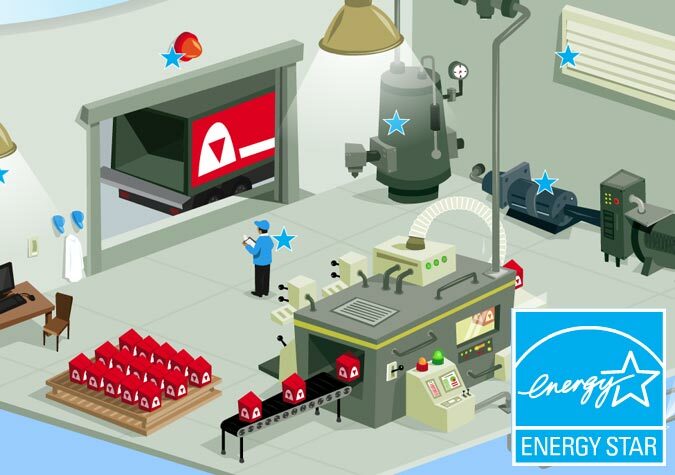 Energy Star offers energy saving tips on its web site. As of May 1, New York City building owners with more than 50,000 square feet must report energy and water use through the Environmental Protection Agency’s Portfolio Manager Tool. Owners will get a benchmarking grade of 1 to 100, with 50 being average. The grade is not unlike miles per hour for cars—complete with fines—but the national program adjusts to reflect regional differences in fuel consumption. To arrive at the grade, building managers must input several variables into the program, including energy use, floor area ratios, number of occupants, and definition of space use. Within a year, potential buyers and renters could check on a building’s efficiency by going to the Department of Building’s website. DOB spokesperson Jennifer Gilbert said property owners are ultimately responsible, but building managers will likely be the one’s plugging in the data. Non-compliance will result in a quarterly fine of $500 or $2,000 annually. The DOB will issue and collect fines. Owners will need to obtain energy use information from their tenants, but as privacy issues may hinder that effort, DOB will provide formulas to calculate information withheld. 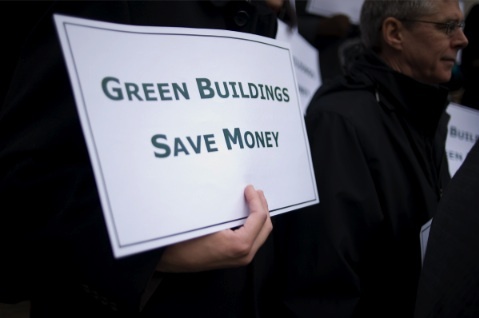 A New Yorker holds up a sign during a rally Monday in support of green buildings legislation that passed the City Council yesterday. Yesterday, the City Council passed landmark legislation aimed at greening the five borough’s existing building stock, with the goal of creating jobs, reducing the city’s carbon footprint, and setting an example for the rest of the country. “Most of us do not look at a skyscraper and see a polluter, but unfortunately, that is the case, and they account for 80 percent of pollution in this city,” City Council member Daniel Garodnick declared from the council chambers last night, before the bills passed with overwhelming support. Quinn said that, based on studies by the New York State Energy Research and Development Authority, voluntary retrofits would work almost as well as mandatory ones, given that when most building owners see the potential savings revealed by the required audits, they would make the upgrades anyway. Under the previous legislation, any building system that failed to meet current standards would have to be upgraded. Landlords and tenant groups had resisted the requirements, fearing the cost of retrofitting buildings and the subsequent rent increases that would accompany them, especially in the midst of such a severe economic downturn. Quinn said the changes created a bill that was fair to all parties and a burden to none. City-owned buildings and small buildings will not be exempted from the required retrofits. The other three pieces of legislation create a new city energy code that is considerably more progressive than the state code to which buildings have been bound, including a requirement for commercial building owners to upgrade their lighting systems and provide sub-metering so tenants can monitor and modify their energy usage, and annual benchmarking of building systems to ensure they are working to optimum efficiency. The council also approved the FRESH program, which gives developers in underserved communities a density bonus if they include a fresh produce store in their project. Hence the press conference today, though it was not being hosted by the building owners and operators opposed to the bill but half-a-dozen environmental groups in favor of it—big ones at that, such as the Environmental Defense Fund, NRDC, and the Urban Green Council (aka USGBC NY)—along with as many council members, who will be voting on the green building legislation Wednesday. This group was not there fighting for the reinstatement of the missing measure but instead bowing to its removal while arguing the package of bills would still set New York on a historic path. "This is fair and responsible," James Gennaro, chair of the Environmental Protection Committee, said. "We'll get to 30 percent one way or another." Let's hope so. When city officials unveiled a plan on April 22 to transform the city’s building stock into some of the greenest on the planet, the environment was seen as a major benefactor, as was the local economy. “Everyone’s been talking about green jobs, but this is the program that will actually do it,” said Mayor Michael R. Bloomberg, noting that the plan is expected to create 19,000 jobs as it cuts the city’s carbon footprint by five percent over the next two decades. But many out-of-work architects are wondering: Jobs for whom? “My understanding—and I’m not an engineer or architect—is that it’s work that will principally involve engineers, auditors, building staff, and trades, but not architects,” said Russell Unger, executive director of the U.S. Green Building Council, New York chapter, in an interview. The first major piece of the program calls for benchmarking standards to track the annual energy usage of buildings of 50,000 square feet or more. Another initiative calls for renovations of buildings over 50,000 square feet to include the modernization of lighting systems, while a third will close a loophole so that minor renovations must also now comply with the energy code. “There’s some work there, but I’m not sure how much,” said Chris Garvin, a partner at Terrapin Bright Green, a strategic consulting firm affiliated with Cook + Fox. Even the most promising—and controversial—piece of the plan, a decennial audit that would require upgrades, might not mean work for architects, because only systems proven to pay for themselves over the course of five years would be required. Then again, Garvin pointed out that with 12,000 buildings in the city falling into this program, there will not be enough qualified auditors to oversee the work, and many architects are prepared to fill the void.